Black balloons and crepe-paper swags contended above our heads. It was a small party, the occasion a friend’s 40th birthday. We drank too much wine, stayed late, and afterward, rather than allowing us to drive home, our friend generously offered us his guestroom. That night I had trouble sleeping. I rolled out from under the blankets and sat in my shorts on the edge of the bed. There was a transistor radio on the nightstand. I found a knob and switched it on. Why this didn’t wake my wife I don’t know. Balled up on her side of the mattress, she snored in easy rhythm over the foggy dislocation of sounds rising from the radio’s tiny speaker. I thumbed the tuner to the station with the strongest signal; still, the reception was poor. Feeling about in the shadows I discovered a telescoping antenna—it was one of those old radios, inexpensive, a hard box of plastic. I swung the antenna up and extended it and the reception improved. A late-night talk show purred into the loneliness of the room; someone was on the phone with the host, someone calling from a far-flung, anonymous place, a woman describing a relationship gone sour. Two relationships, I should say. Her marriage had been adrift for a number of years. Her husband, a salesman, had turned cold, self-absorbed, and frankly she’d become bored with him. And so she’d taken a lover, someone whom she’d met on the internet. The romance was refreshing, exciting, but she didn’t trust this new man. His story didn’t seem to hold together, and lately she’d caught him in a brace of lies. When confronted, the man in his defense had told her that perhaps he had misspoken, or that perhaps she had misunderstood what he had said, regarding these things that now disturbed the once stable symmetry of their relationship. So, the woman asked, what did the host think? Should she break it off with this man and resume the fidelity of a dull and loveless marriage? Or should she instead sort through these issues of trust, commit to this man finally, in spite of his faults, and leave her husband? Or should she do some third thing? The host, a psychologist of dubious bona fides, began to weigh in on the subject, using a measured tone of authority; at that point, the reception began to fade and I reached for the antenna and pulled it all the way out. I mean, I really pulled it all the way out: the antenna fell to pieces. Metal tubes clattered on the nightstand and dropped to the carpet. I held the top piece in my hand, the short end of the stick. Now static filled the airwaves. I wheeled the volume down, switched off the radio, then commenced to feel around on the floor for the remainder of the antenna. I’d broken our friend’s radio. A fine thank you for his kindness. I tried to reassemble the pieces, but in the darkness they did not fit or I did not know how to make them fit. I placed them on the nightstand next to the radio, slid under the covers and waited for daylight. My wife had slept straight through. As we were preparing to leave the next morning I told our friend about the radio. Oh my god, he said. Beloved for a famously deadpan sense of humor, our friend swept past us into the guestroom and tossed up his hands in horror. There’s sentimental value, I said. Yes, yes. Of course. Great sentimental value. I’m sorry, Vaughn. I’ll replace it. I’ll have it fixed. You can’t just fix these. The parts have to come from Amsterdam. Old World, he said. Very rare. On the way home I told my wife that despite Vaughn’s proscription against such gestures, the cardigan had been a fine gift, that in Rhode Island one can never have too many sweaters. Then I began to tell her about the woman caller from last night and her troubles and so on. We kicked around her options. The third thing, my wife said. Definitely the third thing. ​Ed Miller teaches English at Madera Community College. Included among his areas of interest are pop culture, politics, poetry, and postmodern fiction. 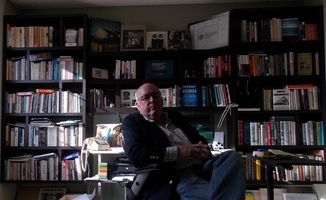 Lately his work has appeared in Review Americana, Stonecoast Review, and Birmingham Arts Journal.